With 435 Jacuzzi® Suites, gourmet cuisine and world-class Vassa Spa, Azul Beach Resort Sensatori Mexico offers the Karisma Gourmet Inclusive® Experience on a grand scale. Suites with heated Jacuzzis for two in the lazy river and guaranteed family connecting suites highlight this new hotel 20 minutes from the airport. Azul Sensatori Hotel features never-before-seen suites that have a heated Jacuzzi for two in the lazy river off the terrace. There are also guaranteed family connecting suites, adults-only and premium sections, and honeymoon suites with wrap-around balconies. Dining at Azul Beach Resort Sensatori Mexico is a perfect orchestration of ingredients, preparation, presentation and service. Gourmet cuisine is the foundation for Karisma Gourmet Inclusive® Experience. To us, it simply means creating sumptuous meals in stunning environments prepared by our star chefs. Azul Beach Resort Sensatori Mexico restaurants range from the hearty to sublime, from family favorites such as Italian, Grill and Mexican to Asian fusion to molecular cuisine. Here, family style meals and 24-hour in-room dining are also yours to savor. The bars at Azul Beach Resort Sensatori Mexico range from swim-up bars to themed lounges to specialty bars such as Mojito Lounge. At Azul, every meal and every drink is a culinary adventure. BBQ Grill: Enjoy a casual lunch on the Beach with a spectacular view of the Caribbean Sea. Dishes include traditional hamburgers, hot dogs, grilled sausages, BBQ ribs and fresh vegetables among others. Hours: 11 am to 3 pm. Le Chique Restaurant: One of the top 10 restaurants in Mexico, Le Chique is a AAA Five Diamond Award winning multi-sensory dining adventure that will challenge any notions you have of how fine cuisine should look, feel and taste. This is Modernist Cuisine, where foods are reimagined to resemble something else. In fact, everything on Le Chique’s avant-garde tasting menu will puzzle and amaze you. Cuisine this inventive deserves to be placed on a pedestal, which is precisely how it’s served – atop a pedestal, inside a hollowed-out book, resting on a sling. Behind this pageantry is Chef Jonatán Gómez Luna and his culinary team, who’ve mastered the art and science of cooking to achieve astounding new flavors, textures and shapes. Adults only restaurant (18 yrs +). Avant-Garde (Modernist) Cuisine. Reservations required. (additional charges may apply) Hours: 6 pm to 10 pm. Siena Restaurant: The authentic cuisine of Tuscany is presented in the ambiance of a bricked Italian wine cellar. Savor the world of fresh, hand-made pasta, crusty pizzas cooked in a brick oven, sauce simmering with fresh herbs, and the aromas of garlic, basil and oregano. Italian Cuisine. Hours: 5:30 pm to 10:30 pm. Spoon Restaurant: With flavors originating from all over the globe, Spoon offers a true world-class dining experience. This specialty restaurant boasts an open kitchen environment with interactive cooking stations, where guests can enjoy the lavish à la carte service and ambiance while observing chefs preparing their meal. World Cuisine. Hours: Breakfast – 6:30 am to 11:30 am; Lunch – 11:30 am to 5:30 pm; Dinner – 5:30 pm to 10:30 pm. Tapaz Restaurant: At Tapaz, chefs not only create sumptuous world cuisine, but also personally present each masterfully prepared meal to their guests. And with oversized tables to add to the fanfare, Tapaz is ideal for those in search of a family style setting, where food is celebration of tastes. Spanish Cuisine. Hours: Dinner – 5:30 pm to 10:30 pm; Night Bites – 10:30 pm to 1 am. Pizza, Dude! : You will find a great variety of delicious pizzas… using only the freshest ingredients and keep them simple. The favorites of the Teenage Mutant Ninja Turtles®. Hours: 11:00 am to 6:00 pm. Zavaz Restaurant: With breakfast staples like eggs Benedict, pastries and fresh fruits, this Caribbean bistro is the perfect way to start your day. At lunch, the Gourmet Burger Bar opens with their namesake juicy bites, as well as fresh seafood and savory grilled chicken dishes. During dinner you can explore a popular menu full of island-flavored fare. Caribbean Cuisine. Hours: Breakfast – 7 am to 10 am; Lunch – 12 pm to 3 pm; Dinner – 5:30 pm to 10 pm. Zocalo Restaurant: Zocalo is a vibrant celebration of food, energy and music. Refreshing and unpretentious, this seaside Mexican eatery boasts lush surroundings with enticing culinary creations along with a kids menu. Authentic Mexican Cuisine. Hours: Breakfast – 7 am to 10 am; Lunch – 12 pm to 4 pm; Dinner – 6 pm to 10 pm. Mojito Lounge: With an impressive menu of 18 different specialty Mojitos, premium cocktails, a DJ spinning your favorite tunes and beautiful views of the Caribbean, Mojito Lounge is a treat for all of your senses. Adults only. Hours: 11 am to 2 am. Swim-Up Bars: For the ultimate cool down and the one of the best ways to spice up a relaxing vacation, belly up to one of Azul Sensatori Mexico’s three swim-up pool bars. They add a whole new meaning to watering hole. (Wave, Zocalo and Zavaz) Hours: 10 am to 5 pm. Wave Bar: By day this lively bar located in the adults-only section of Azul Sensatori Mexico is the perfect place to grab an underwater bar seat or poolside lounge and soak up the tropical flavors and the sun. At night, the DJ beats keep the vibe going at the illuminated lounge side of the bar. Adults only. Hours: Swim-Up Bar – 10 am to 5 pm; Lounge Bar – 10 am to 5 pm; Shisha Bar – 6 pm to 10 pm. Zavaz Lounge: With pools on every side and knowledgeable and outgoing bartenders, Zavaz International Caribbean bistro and lounge is the perfect place to relax and savor your favorite tropical libations. Hours: 10 am to 10 pm. Zocalo Cantina: Experience a true Mexican cantina and Caribbean views, while talented mixologists prepare and serve Mexican specialties, from domestic beers and smooth tequilas to your favorite domestic and international premium brands. Hours: 10 am to 1 am. With 435 elegantly appointed Jacuzzi® suites including an exclusive Adults Only Premium Section, there’s plenty to love about Azul Beach Resort Sensatori Mexico. Here, no luxury or amenity has been overlooked, including views that go on forever. Settle in and enjoy all of the Gourmet Inclusive® amenities, including remote control air conditioning, your choice of a king-size bed, two queens or one queen + sofa bed, in-suite Jacuzzi®, over-sized balcony or terrace and a minibar stocked daily with your preferred snacks and beverages. Enjoy 24-hour in-room dining, satellite TV, DVD player, safety deposit box, direct dial telephone, iPod docking station, coffee maker and deluxe bathrobes. Luxury Jacuzzi Suite: The Luxury Suite has a large living space with sleeper sofa. The Suite features a king size bed or two canopy queen size beds, plus an in-suite Jacuzzi for two. All Suites have an over-sized terrace with pool or garden view, air conditioning, 32″ plasma TV, DVD player, I-Pod docking station radio/alarm clock, safety deposit box, in-suite hydro jet Jacuzzi, once daily stocked minibar, iron and ironing board, coffee maker, balcony or terrace, direct dialing telephone, marble bathroom with rain forest shower head, hair dryer, double sink, vanity mirror and toiletries. Max Occupancy: 2 Adults + 2 Children or 3 Adults + 1 Child; Size: 640sq. ft. (60 m2). Family Jacuzzi Suite: These kid friendly suites have a master bedroom with Jacuzzi for two. Frosted glass sliding doors separate this area from the living space where there are double and single sleeper sofas for the children. Suites are located in the Family Section of the Resort, these over-sized Suites have terrace with pool and garden view, air conditioning, 32″ plasma TV, DVD player, I-Pod docking station radio/alarm clock, safety deposit box, in-suite hydro jet Jacuzzi, once daily stocked minibar, iron and ironing board, coffee maker, over-sized balcony or terrace, direct dialing telephone, marble bathroom with rain forest shower head, hair dryer, double sink, vanity mirror and toiletries. Max. Occupancy: 2 Adults + 3 Children or 3 Adults + 1 Child; Size: 625 sq. ft. (58 m2). Premium Jacuzzi Suite: With a Premium Suite, you’ll have an in-suite Jacuzzi for two, and pool butler service exclusive to Premium Suites. Suites are spacious and have canopy beds, over-sized terrace with ocean and pool views, air conditioning, 32″ plasma TV, DVD player, I-Pod docking station radio/alarm clock, safety deposit box, once daily stocked minibar, iron and ironing board, coffee maker, direct dialing telephone, marble bathroom with rain forest shower head, hair dryer, double sink, vanity mirror. Upgraded amenities and services include pre-arrival concierge service, champagne, flowers, fruit basket, pillow menu, aromatherapy menu, deluxe toiletries. Max. Occupancy: 2 Adults + 2 Children or 3 Adults + 1 Child; Size: 620 sq. ft. (57 m2). Jacuzzi Swim Up Junior Suites: Located in the Adults Only Section of the Resort (18+yrs only), hop into the lazy river lapping at the edge of the veranda in the ground level Junior Swim Up Suites. Enjoy the canopied king size bed and an in-suite double Jacuzzi. All Suites feature an over-sized terrace with pool, garden or ocean view, air conditioning, 32″ plasma TV, DVD player, I-Pod docking station radio/alarm clock, safety deposit box, in-suite hydro jet Jacuzzi, once daily stocked minibar, iron and ironing board, coffee maker, over-sized balcony or terrace, direct dialing telephone, marble bathroom with rain forest shower head, hair dryer, double sink, vanity mirror and toiletries. Max Occupancy: 2 Adults; Size: 520 sq. ft. (49 m2). Royal Swim Up Suites: These suites feature a private outdoor Jacuzzi and a bed right in the swim up just a few steps off the terrace. Ocean and pool view. One king or 2 queen size beds. Ocean and pool view. Art deco. Royal Services such as: Private check in, champagne and fruit basket in room on arrival, pillow and aromatherapy menu selection, wireless internet access, Personal Concierge service, DVD´s, beach and pool butler, microwave, cabinet with bottle dispenser and 4 bottles of Premium liquor. Located in the Premium Section. Max occupancy: 2 Adults+ 2 children; Size: 640/620 sq. ft. (60/57 m2). Connecting Luxury Jacuzzi Ocean View Suites: Connect two Luxury Suites with ocean views to accommodate your family or friends. You’ll have two living areas and two bedrooms, each with a Jacuzzi for two, plus a king or two queen king beds. All Suites have an over-sized terrace with ocean view, air conditioning, 32″ plasma TV, DVD player, I-Pod docking station radio/alarm clock, safety deposit box, in-suite hydro jet Jacuzzi, once daily stocked minibar, iron and ironing board, coffee maker, balcony or terrace, direct dialing telephone, marble bathroom with rain forest shower head, hair dryer, double sink, vanity mirror and toiletries. Max Occupancy: 6 Adults or 4 Adults + 2 Children or 3 Adults + 3 children or 2 Adults + 4 Children; Size: 1,250 sq. ft. (116 m2). Honeymoon Ocean Front Jacuzzi Suites: One king or 2 queen size beds, over-sized 600 square foot balcony and Ocean front view. Premium Services such as: Private check in, champagne and fruit basket in room on arrival, pillow and aromatherapy menu selection, wireless internet access, Personal Concierge service, DVD´s, beach and pool butler service. Located in the Family and Azul Section. Max. occupancy: 2 adults; Size: 625/620 sq. ft. (58/57 m2). 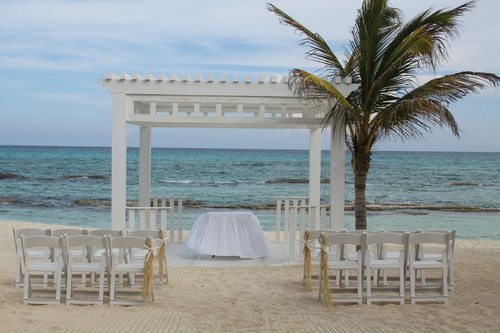 Presidential Studios: Designed in contemporary Caribbean style, with dark wood accents, canopy beds. Suite features an over-sized 600 sq. ft. terrace or balcony. Premium services such as: pre-arrival concierge services, champagne and fruit basket in room on arrival, pillow and aromatherapy menu selection, wireless internet access, personal concierge service, DVDs, exclusive pool area with pool butler service. Equipped with air conditioning, king size or two queen beds, 32″ plasma TV, DVD player, iPod docking station, in-suite hydro jet Jacuzzi, radio/alarm clock, safety deposit box, amenity kit, once daily stocked minibar, iron and ironing board, coffee maker, direct dialing telephone, deluxe bathrobes, private marble bathroom with rain forest shower head, hair dryer, double sink and vanity mirror. Max. occupancy: 2 Adults/ 2 children. One Bedroom Presidential Suites: Located on the 4th floor of the Premium Section. This suite features a private living room with dining area for 6 people and fully equipped kitchen, a master bedroom suite, plus one extra bedroom with 2 queen size beds. Ocean and pool view. Presidential Services such as: Private check in, champagne and fruit basket in room on arrival, pillow and aromatherapy menu selection, wireless internet access, Butler service, full bar, DVD´s, beach or pool cabana bed reserved, pool and beach butler, dinner reservations, in suite chef´s private cooking dinner. Ocean and pool view. Max Occupancy: 2 adults + 2 children; Size: 1,294 sq. ft. (120 m2). Azulitos Play House by Nickelodeon: Give your children a vacation experience they’ll never forget, with ultimate access to Azulitos Playhouse by Nickelodeon. There are fully themed activities planned for every day. And with trained professionals always ready to encourage participation and play, parents are free to enjoy Karisma’s greatest luxuries, including gourmet cuisine, king-size Bali beach beds with butler service and the beautiful white sand beaches of Riviera Maya. Hours 9:00 am – 5:00 pm and 7:30 pm – 9:30 pm. Ages 4-12 years old. *Children under 4 years old require adult supervision.